The lantern artist Jang Jin-ik and his work Fulfillment of Emptiness II at the Korean gallery. Every spring, the streets of Seoul, South Korea are illuminated by beautiful lanterns in celebration of Buddha’s birthday. This past November, these lights traveled from Seoul to Oregon to brighten up many Portlanders’ hearts. 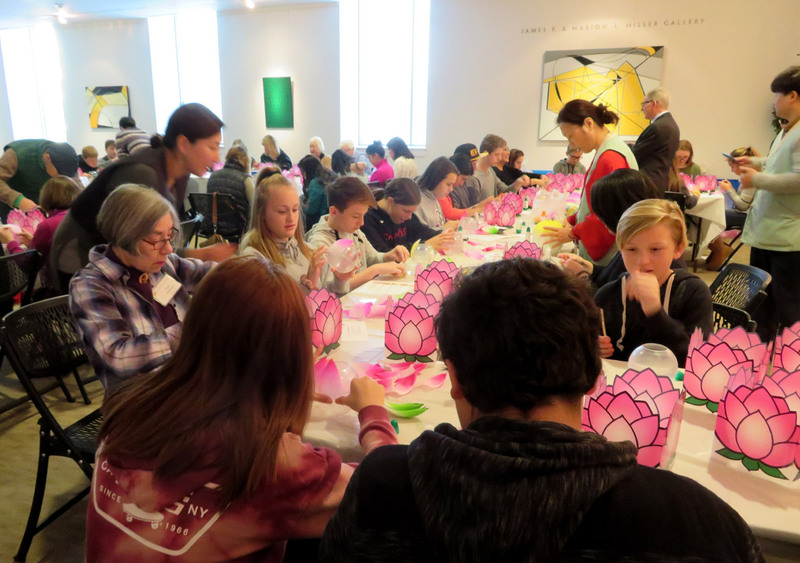 On November 18th of this year, the Museum hosted a Korean Lantern Workshop with the support of the Yeon Deung Hoe (Lotus Lantern Festival) Preservation Committee, the Museum’s Asian Art Council, and the Office of the Consul General of the Republic of Korea in Seattle. 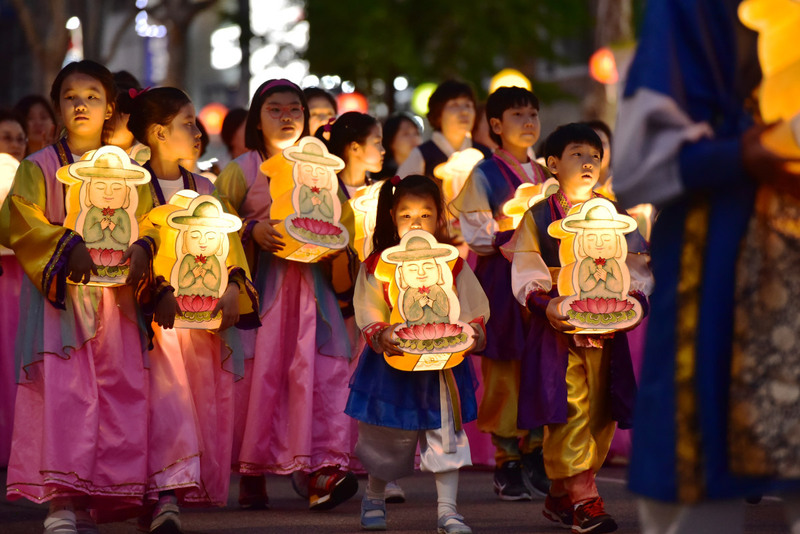 An affiliate of the Jogye Order of Korean Buddhism, the Yeon Deung Hoe Preservation Committee was established to conserve and promote the Lotus Lantern Festival, a cultural event with more than 1,000 years of history. The Festival is celebrated for three days every spring, with thousands participating in lantern making, lantern exhibitions, lantern parades, and various performances. 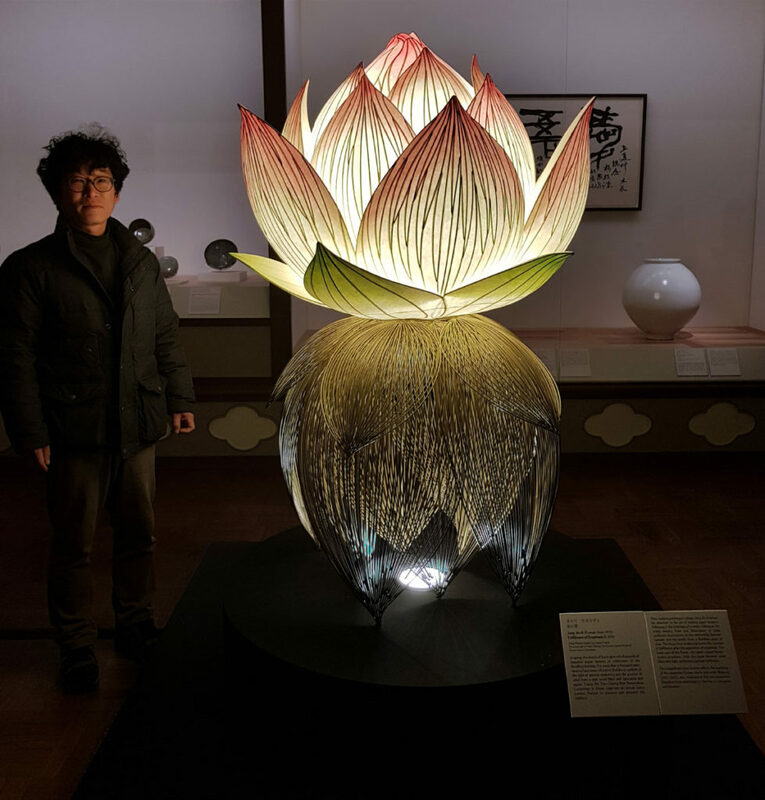 The Lotus Lantern Festival has been designated as an Important Intangible Cultural Property in Korea for its historical and cultural significance. The Lantern Workshop in Portland was the first fruit from the new relationship with Jogye Buddhist Order that was forged through the recent repatriation to Korea of an important Buddhist icon: a painting of Five Buddhas. The painting’s owners, Robert and Sandra Mattielli of Portland, graciously agreed to return it to its original home in the Songgwangsa monastery. The monastery, in turn, invited a group from Portland to visit, including the Mattiellis, Museum director Brian Ferriso, Curator of Asian Art Maribeth Graybill, curatorial fellow Sangah Kim, and members of the Asian Art Council. When the group visited the Jogye Order Headquarters in Seoul for an interview with the executive chief monk of the Order, they were amazed by the beautiful lanterns on display in the lobby of the building. Hearing the praise, the Yeon Deung Hoe Preservation Committee suggested not only having a lantern-making workshop in Portland as a tangible step toward a partnership but also donating lantern artist Jang Jin-ik’s beautiful lantern to the Museum— the offer was happily accepted. For the Workshop, a delegation of seven people, including four artists, came to Portland from Korea to teach lantern making. The event completely sold out, to more than one hundred participants of all ages and cultural backgrounds. Lantern-makers included students from Baker Prairie Middle School, which has an exchange program with a Korean school; seniors who are interested in Korean culture; youth in the Caldera arts program; and Korean-Americans. After a brief introduction and demonstration, participants sat down to concentrate on making their own lanterns, either in the shape of a lotus blossom or a lucky pouch. The visiting artists guided them through the process, assisted by many local volunteers. At the end of the hour, the Miller Gallery was flooded with light radiating from a plethora of lanterns, highlighting their unique and creative designs. As a final celebration, the lantern makers had their own parade about the room and sat for a commemorative photo. It was the goal of the Yeon Deung Hoe Preservation Committee that their lanterns bring the light of happiness and peace to Portland. The lanterns and the memories of this one-day immersion in Korean culture will last a long time for everyone who participated. This event would not have been possible without the extraordinary generosity and enthusiasm of the Yeon Deung Hoe Preservation Committee, the Asian Art Council, Honorary Consul for the Republic of Korean in Northern Oregon Greg Caldwell, and many volunteers. The Museum looks forward to sustaining and growing the partnership with the Jogye Order. For more information about the Lotus Lantern Festival, visit http://www.llf.or.kr/eng/.